Drug associated violence is decimating the tourist industry in Mexico. In the towns of Baja California, where much of daily commerce is about providing services to visitors, streets are silent, opportunities to make a living drying up. My husband Bruce and I had not planned to go either. But the opportunity to pet whales and make the 900 mile trip easily by small plane brought us to Mulege, a rustic town on the Sea of Cortez. Before going we had no idea how important it was to the town that we, and 30 other planes, made the trip. Bruce and I fly in on the last Friday of February, our plane kicking up dust on the beach-side dirt airstrip of the Hotel Serinidad. We are motioned into the parking area as another plane lines up to land. 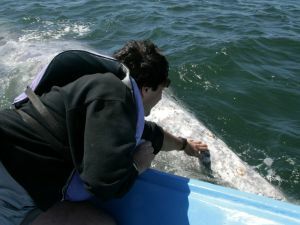 For the next three days we are joining the Baja Bush Pilots in Mulege for their annual whale petting adventure. This association of private pilots is orchestrated by a guy from Arizona, Jack McCormick, and he greets one plane after another like we are all part of his family reunion. It will be a few hours before everyone arrives so we take a stroll along the river. 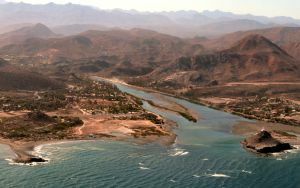 The Mulege River is the only navigable river along the Sea of Cortez and it is the reason the town survives against this arid backdrop. A fresh breeze blows in from the sea, rustling palm trees and keeping the temps pleasant. An enclave of 50 relatively new homes lines the river but many lay deserted, without roofs and open to the sky. Over fish tacos and cocktails at the hotel that evening we learn this once thriving ex-pat community was heavily damaged in a hurricane the year before. Many folks aren’t rebuilding. The next day we explore the vacant, dusty streets of Mulege. Mulege is the mid-point overnight stop on the 1,000 mile highway stretching from the U.S. border to Cabo San Lucas. This simple town depends on providing goods and services to travelers. 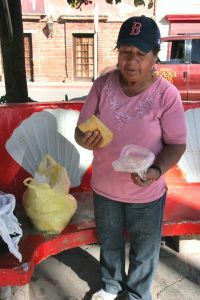 A modest town square is deserted except for a woman selling her chicken tamales, still warm and tasting of home. Two children approach us and tentatively present a can for donations to rebuild their school. Behind them shops display flip flops and straw hats for sun-seekers who didn’t show up this winter. One day we launch our fleet of small planes for the Pacific side of Baja and Laguna San Ignacio, the world’s largest Grey Whale nursery. The lagoon is so large it is easy to loose sight of the shore as we bob around hoping for a 35 ton whale to approach our 10-person open boat. We are told that the whale count in the lagoon this year is 300 mothers and pups and they aren’t shy. We are surrounded by breaching and spouting. A whale glides in, close enough to touch the coarse rubbery skin, its frying pan sized eye glinting up at us. Laguna San Ignacio is justifiably popular with visitors but few have made the drive this year and most campsites surrounding the lagoon are unoccupied. On our last evening an assortment of local cars transports everyone to the center of Mulege for an al fresco fiesta. The Mayor greets us and explains that when the hurricane of the previous year left the town without vital water, food and medical supplies he made a call to Arizona. Jack gathered several tons of humanitarian aid and enlisted a convoy of his bush pilots for multiple flights. Tonight the town honors their friend, Jack, and officially thanks us all for flying to Mulege. Three days earlier we had expected to enjoy meeting other pilots and seeing whales up close. Now it seems more important that we got the chance to help Jack help his friends in Mulege. The Baja Bush Pilots, reporting a 60% decrease of general aviation (small private planes) to Mexico over the last few years, has announced it is forced to move many recreational trips out of Mexico to more stable destinations and change the association name to Bush Pilots International. great writting Karen…….another of your many talents. really,really enjoyed this, cant wait for coffee and more of your adventures. Nice article Karen, I really enjoyed it!